Dr. Redmon grew up in the small town of Urbanna, Virginia. After graduating from Christchurch School, she attended Mount Holyoke College in Massachusetts where she graduated with honors (Phi Beta Kappa). Dr. Redmon went on to receive her medical degree with honors (Alpha Omega Alpha) from the University of Virginia. She completed her otolaryngology surgical residency at Ohio State University. Dr. Redmon was board certified in otolaryngology head and neck surgery in 1999. 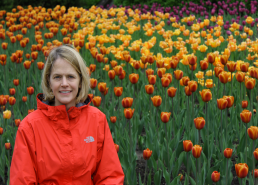 She has been practicing medicine in the Richmond area since 1998. She opened Comprehensive ENT, P.C. in 2006. Her free time is devoted to raising, with the help of her husband Rich, their twins, Eli and Lyla, and enjoying the pleasure of watching them grow up. 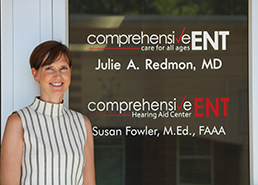 Susan Fowler is both a state licensed and nationally certified audiologist. She earned her undergraduate and graduate degrees from the University of Virginia. She is also a fellow of the American Academy of Audiology. She has worked with Dr. Redmon since 1998, but has been a practicing audiologist since the late 1980s. As a clinical audiologist she offers services including, but not limited to, comprehensive hearing tests, the evaluation and treatment for vertigo (dizziness), newborn hearing screenings, pediatric hearing evaluations, and fittings with customized hearing aids. She also fits custom earplugs designed for musicians, hunters, and swimmers. She enjoys getting to know her patients and their interests. She feels this helps her to offer the best hearing solution to suit their needs. When not working, Susan enjoys reading, running, and traveling with her husband of 30 years.